George, Lord Seton petitioned Pope Paul II (reigned 1464 – 1471) to convert this parish church into a Collegiate Church when the incumbent priest left. Seton probably anticipated that he would vacate the position in the near future but in 1482 a priest is still in place indicating that the building was still a parish church. 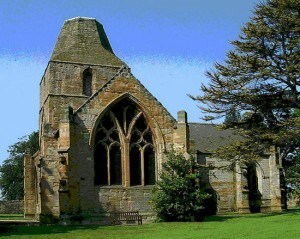 In 1488 the church is described as being a collegiate church for the first time. In 1492 a Papal Bull granting collegiate status was issued by Pope Alexander VI following the petition of George, the second Lord Seton. This picture shows Seton Collegiate Church from the south and shows a wee bit of the lovely setting. The church is set in a small, green, parkland is surrounded by a wall and is something of a ‘sun trap’. It can be clearly seen from this picture that the church spire was unfinished and is reminiscent of Rosslyn which is also unfinished.